I really need a new Fall jacket. I know that it’s strange to be thinking of jackets and Fall when it’s August and still blazing hot outside but my mind is already in Paris 😮 Also, Fall is my absolute favourite time of year when it comes to clothing! I don’t know what it is about the Fall, maybe it’s that the colours are so rich and the styles are so classic but I just always get excited about buying new clothes (it may have to do with that whole “back to school” mentality). 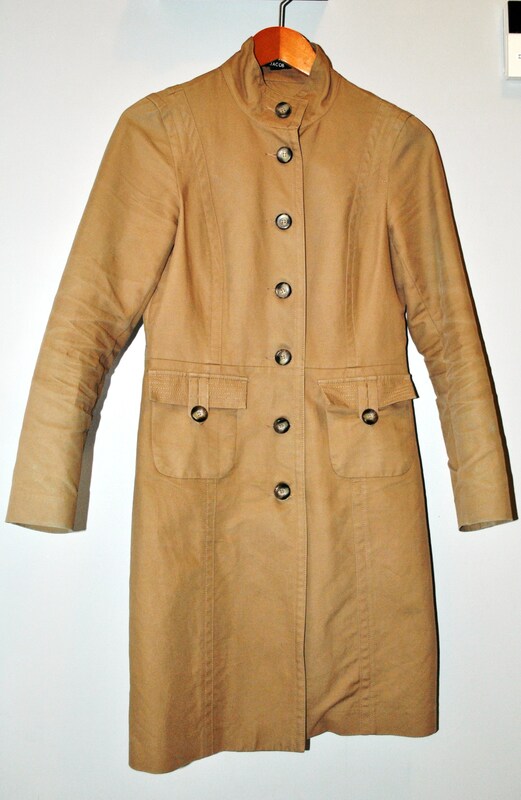 At present I own a tan trench coat that I got at Jacob years ago and although it’s in good shape (besides needing a good dry cleaning and pressing) I’m a little tired of it and want something new! 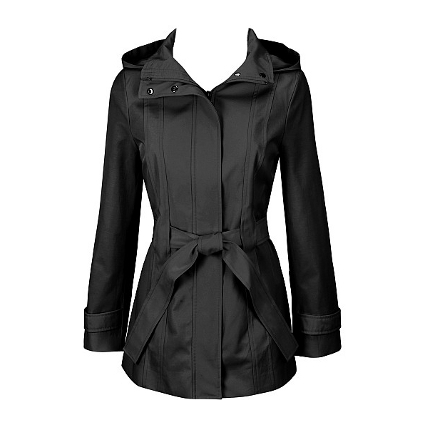 Plus it has no hood and isn’t the most waterproof so I think that I need to find something a little more hardy. I bought this at Jacob probably 6 or 7 years ago. The other day when I was in Winners (shopping for my last challenge) I came across a beautiful Calvin Klein trench coat. It was black, had a hood, and was made of water-resistant material. Did I mention it was beautiful? It was $79.99 which actually isn’t a bad price for a designer jacket but sadly $79.99 is double my $40 budget and they only had it in size medium (I wasn’t swimming in it but it just didn’t fit quite right, I think that a smaller size would have been perfect though). Come to think of it, it’s probably a good thing that they didn’t have it in my size otherwise I probably would have walked out of the store with it! So the black Calvin Klein trench coat is going to be my inspiration for this challenge. Hopefully I can find something similar within my budget because I was really smitten with it and I know that I could get a lot of wear out of such a classic style! I don’t know if there’s one near you, but I saw some cute trenches at Joe Fresh! Pretty reasonably priced, and they had black. I think they were about $40-50. (Maybe you can use some savings bank?) I know when I was in Paris, I didn’t see many hoods up! Have you thought about maybe a hat or an umbrella paried with a hoodless jacket? It’s a very cute look! I was also thinking that Joe Fresh might be a good place to check! I was actually at Superstore yesterday but I didn’t see any trench coats. I think that the store near me was just starting to get their fall clothing in (they still had a lot of summer clothing on clearance) so they may have more stuff soon. I’m going to check later in the week. I don’t mind taking a little bit of money out of the savings bank if it means that I can get a nicer coat since investing in a good coat is always a good thing! I’ll definitely also have to reconsider having a hood on the coat, thanks for the advice! I have a nice red Esprit umbrella so I think that would look cute with a black trench! Now if only I could afford some high heel Hunter boots to complete the look LOL! Im often to blogging and i actually recognize your content. The article has really peaks my interest. I am going to bookmark your website and preserve checking for brand new information.